Does Is Make Sense To Refinance? Mortgage interest rates have been all over the place in the past 30 days. One day they drop significantly and the next they are on the rise. If you lock in rates at just the right time, you may be able to time the market perfectly. Before you celebrate your interest rate reduction there are a few things to consider. A lower interest rate may not mean a lower monthly payment. While this sounds hard to believe it is often the case when you refinance. Getting the lowest possible interest rate is great but there are a few other items to consider. Before you start your refinance application here are some things you need to keep in mind. Appraisal Amount. A refinance for a primary residence and investment property are not the same. With a primary residence you may be able to get away with a loan amount at 80% of the appraisal amount. With an investment property your loan amount may need to be 70% depending on the type of loan you take. Even if property values are up in your area your home may not appraise for the value you think. The appraisal takes a snapshot of what is currently happening in the market. A sale from six months ago will not have the impact you think. The most accurate values come from sales under 90 days usually within a mile from the property. Getting your property to appraise at the value you are looking for is the biggest hurdle in your refinance. Closing Costs/Property Taxes. Perhaps the biggest difference with a refinance and a purchase is in how the closing costs are paid. In a purchase the closing costs are brought to the closing. With most refinances the closing costs are rolled into the new loan amount. You have the option of bringing the funds to the closing but most people do not. The closing costs are almost identical regardless of a purchase or refinance. The costliest item at the closing will be for the prepaid property taxes. The new lender will restart your escrow account and hold a significant amount of property taxes. Depending on when you close it can be as much as six months of taxes. Between your property taxes and closing costs your new loan will end up being thousands above the amount you currently owe. Decreased Equity. Your new loan amount will directly impact the amount of available equity. Even though equity may not seem important it gives you different options in a pinch. If you needed to sell in a moments notice equity will allow you to walk away without worrying about your bottom line. It also allows you to possibly refinance and pull cash out down the road. 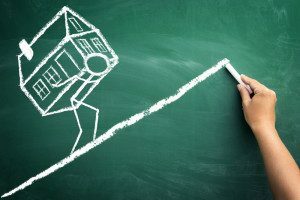 With a higher loan amount and decreased equity you may be more inclined to hang onto the property if the market shifts. Longer Term. The most common loan term is the 30 year fixed. As the name indicates this loan has set payments for the next 360 months. Before you refinance you should take note of how many years you have remaining on your current mortgage. In most cases you will be adding on years to your term and starting over. If you had 22 years left you essentially have nothing to show for the last eight years of payment. With the longer term you may be able to save money per month but at the expense of extra years. This isn’t to say that all 30 year terms are bad but you need to weigh the added years versus the monthly savings. Monthly savings. It is possible that a lower interest rate may not equal monthly savings. When you add in the closing costs and property taxes your new loan amount will increase. It is not uncommon for your new loan to be anywhere from $8,000-$10,000 higher depending on the annual property tax amount. The higher your loan amount the less change in interest rate needed to make an impact. A quarter point difference on a $500,000 loan will produce a greater savings than a full point change on a $100,000 loan. Any savings need to justify the increased term as well as the closing costs. You also need to weigh the savings with your long term plans for the property. If you plan on selling in the next few years the savings won’t have as great of an impact. Shorter term/higher payment. As popular as the 30 year fixed is there are other loan terms available. You may consider refinancing out of a 30 year into a 15 year. In doing this the first thing you will notice is how much lower the rate may be. The 15 year fixed works opposite of a 30. With a shorter term your payment will increase in spite of a reduction in rate. If you are not comfortable with the payment you will eventually run into trouble. One alternative to this is keeping the longer term but making one extra principal payment a year. This gives you the security of a more comfortable payment while still reducing your balance over time. If you are considering a refinance there are a few initial steps you should take. The first is to find a mortgage calculator online and run the numbers. Add your closing costs to your loan amount to find your new monthly payments. You should use a conservative interest rate with your estimate. The next thing you should do is to get an idea of current property values. Keep in mind that you will need an increased value on an investment property. If the numbers make sense and you think the value is there now may be a great time to refinance.